We have our new Online Pest Control system up and running and working very well. Our customers tell us that they’re very happy with it! You get a choice of a paper-based system, an Online Pest Control system or a mixture of both. It is tailored to our BRC / SALSA client’s inspection and compliance needs. Using our old system, we recorded everything using pen and paper and put the information in the (paper) folder. We did the maps and tray analysis in the office later on. All of this was fine and worked well but now we are offering an even better way of doing things. Our new Online Pest Control system is different and much more efficient and gives the customer much more choice. Do you want Instant Reports? As a customer, you get your reports instantly. Our Technicians input the information into their phone as they are going along. They then submit it and the report goes straight through to the electronic portal. When they empty the flycatcher trays, and do a fly count, this builds the graph immediately. So you would log in via the website and access all the information instantly. You don’t need the paper folder anymore as everything can be accessed online. However, you may not like it if you were being inspected and the internet connection failed! It would be a serious issue, so most customers have a paper back up, just in case! You can have the option of a purely online pest control system, both systems or a purely paper system – whatever you want. So if both systems are required, you are given a unique log-in to access it all online plus we print out the reports there and then (using mobile printers), and it goes straight in the customers file. We also have customers who just want paper copies and aren’t interested in accessing it online. So it is just printed out at the end of the visit. Do you want information at your fingertips? You can log in at any time and examine your Pest Control record. This system has been especially created for Premier Pest Control – just for us – and it has been designed to be very simple and user friendly. What information can you get online? Health and Safety/Risk Assessments (as shown). 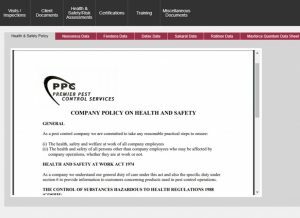 Here you will find Premier Pest Control Health and Safety policy and the data sheets that you need. Misc Documents includes staff ID’s of our people who look after your premises (including photos), as well as Pest Identification Charts etc. 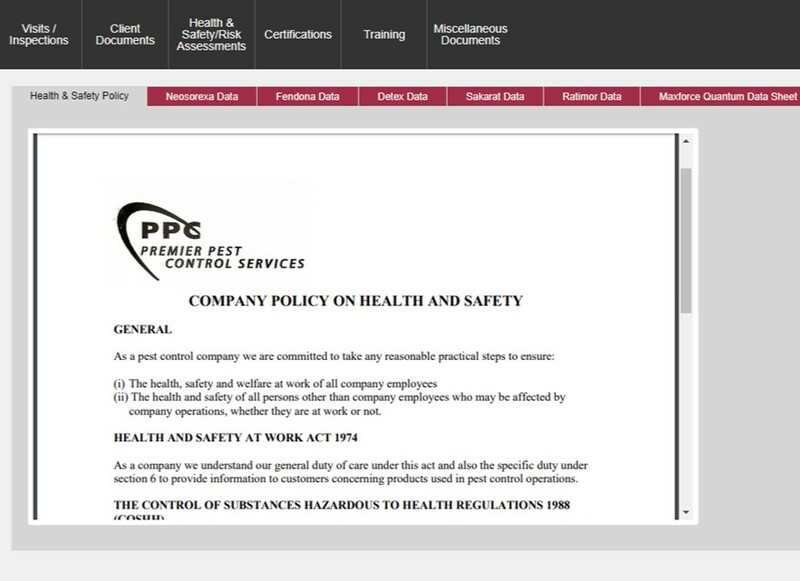 The picture shows the H&S screen, which then has its’ own tabs with all the H&S information in. The other categories are also straightforward, as you can see. Each set of documents is unique to you, and no one else can access them (apart from some of our staff). And the whole system is super easy to use! Just call our friendly office staff on 01274 612559. We are happy to come to your premises and give you a demonstration of our online pest control system, and a quote for your Pest Control service.